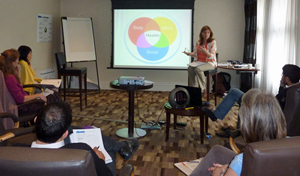 META-Health Speaker Training - META-Health Academy. 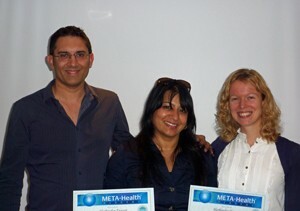 META-Health Speaker Training - META-Health Academy. Why Take this Speaker and Trainer Training? This unique course brings together Robert and Joanne’s knowledge and experience (20 years) of how to teach and train META-Health effectively with skills and theory on successful public speaking, including how to structure your presentations, how to use body language to strengthen your message and how to overcome common objections and difficulties. The Trainers’ Training was awesome, so much fun. Everything is so easy, once you know how! We all had blocks and barriers to presenting; therefore introducing the therapy section which addressed these issues was invaluable. I am passionate about Meta-Health and I have a strong desire to share this information and educate those who are ready to hear it. I am so grateful to Rob and Jo for their unwavering support and guidance in helping me to achieve this goal. What a wonderful three days, with amazing people, thank you all for the learning and support, awesome!!! Great weekend - EVERYONE can be sure that if they choose to learn/study/develop with the META-Health Academy they will receive support far beyond the norm. Thank you Jo and Rob - Love to all from Maggie Meta Health Coach and now Trainer! The trainers’ training course is action-packed and intense and will certainly enhance your skills as a presenter and help you plan and prepare outstanding META-Health presentations. Jo and Rob’s expertise and wisdom ensured a quality learning experience, and the mix of practical activities and formal learning made the course fun and enjoyable. I wholeheartedly recommend this training to all META-Health coaches. Robert and Joanne have formulated and continue to evolve a unique synthesis of philosophies, methodologies and techniques from META-Health, Health Analysis, Life Coaching, Systems research methods, cybernetics, psychotherapy, systemic therapy, NLP, EFT, Energy Psychology, META-Kinetics Advanced Kinesiology and The Human Design System. As such, they have developed unique and unparalleled approach to coaching and therapy. Robert and Joanne have been teaching META-Medicine and META-Health since 2007, and have shared META-Health principles with thousands of people through their talks, courses and articles. They ensure that participants gain maximum learning and experience, as well as developing a deeper understanding and of course, some transformation of their own! This is a professional-level course for those with knowledge and experience in using META-Health. The pre-requisite for this course is the META-Health Practitioner Training. If you're qualified as a META-Health Practitioner, you can achieve META-Health Speaker status after successfully completing this course and requirements. 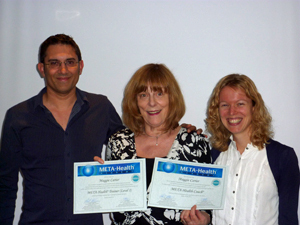 If you are a META-Health Master Practitioner, you can also work towards META-Health Trainer status after completing the Speaker and Trainer Training. If you have completed your training with another META-Health Master Trainer, please email us with your details. On successful completion of the Trainers’ Training and course requirements, you gain qualification as a META-Health Speaker (MH-S), enabling you to deliver META-Health introductory talks. If you are a META-Health Master Practitioner, the next step after qualifying as a Speaker is META-Health Trainer (MH-T), which enables you to teach META-Health introductory courses of up to 3 days’ duration. This level is gained after the Trainers’ Training by doing 30+ hours’ worth of talks over a year, and successfully organising and co-presenting one or more META-Health introductory courses with your META-Health Master Trainer(s).